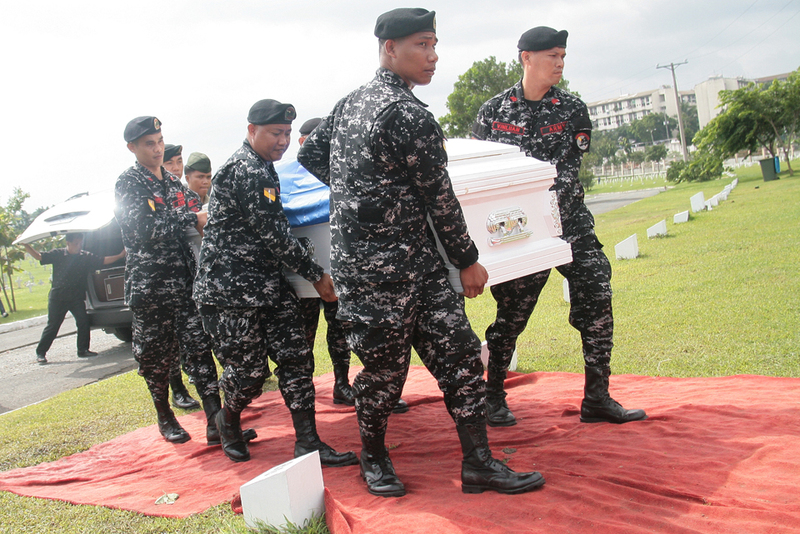 Somber tunes played from trumpets as six men in black-and-white fatigue carried a flag-covered casket to a tent inside Libingan ng mga Bayani. They were not carrying a personal comrade, but the man nevertheless shared the same scout ranger uniform, wore the same black beret, and vowed to fight for the same country. Pfc. Jose Marvin Talamante Jr. is given full military honors during his burial at Libingan ng mga Bayani in Fort Bonifacio on Thursday. Talamante, 24, was one of 10 soldiers killed by the Abu Sayyaf last week in Basilan, where he was assigned for three years. The priest read the final rites from his tablet, swiping through the verses while a lady cried for the fallen soldier, her lost son. But a ringing phone broke the sad silence, playing Jingle Bells while the owner hurried to cancel the incoming call. Pfc. Jose Marvin Talamante Jr., however, won’t be coming home for Christmas. Talamante’s battle comrades are in Basilan, where he and nine other soldiers were killed in action by the Abu Sayyaf in Sumisip on July 26. It was his fourth year in service, and his third on assignment with the 11th Scout Ranger Company based in Tipo-tipo. At 7:30 am, Talamante and his company were clearing the area at a rubber plantation less than 5 kilometers from the nearest base. They just fended off an estimated 40-strong enemy squad in a skirmish. “Nananalo na sila,” said Cabunoc. But the Abu Sayyaf squad ballooned to a claimed number of 150 only 15 minutes later, shooting at the 40-man military troop from three sides. Military back-up of 50 soldiers arrived two hours later. It was only 10-man stronger than the troop under fire, but Cabunoc argued they were supported by artillery. Talamante, positioned up front, died from a head shot. The military was checking a reported presence of armed men within the rubber plantation’s vicinity that were poised to attack Tumahubong, and a gun battle ensued upon contact, according to Cabunoc. Talamante’s mom, a retired teacher, and father, a retired NCO, can only find comfort knowing that their son, their fourth child of five, died while fighting on duty. On Thursday, she cried her worst fears for her son in duty, who was inspired to join the army after hearing tales from retired soldiers in their Taguig neighborhood. The soldiers carried the flag above the casket it once clothed as it was brought down the grave. “Saan ninyo dadalhin ang anak ko… Di ko na siya mayayakap,” Constancia wailed. Dozens of soldiers have died in the jungles of Basilan through the years, where the army continues to struggle against armed threats to peace. But until the army and government has found a solution, more soldiers like Pfc. Talamante will come home to their mothers in coffins, and Christmas won’t be the same. Ronin’s note: It’s been almost 6 months since I went to Libingan ng Mga Bayani. This is an unpublished piece for work I was supposed to post here before Christmas, but I had hacking issued then.